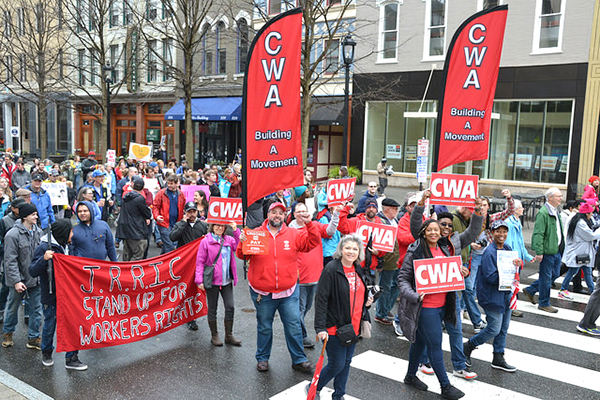 More than 20 CWA members from five different locals across North Carolina joined the Moral March in Raleigh on February 10 to advocate for pro-labor policies that ensure economic justice, resilience, and sustainability. The Moral March, now in its 12th year, was originally founded by former NC NAACP President Dr. Rev. William Barber, III. This year's theme is "Taking the Resistance to the Ballot Box." Thousands of activists from across the country showed up despite the rain to march to the North Carolina State Capitol to emphasize the importance of being present in the community and voting in November. "This powerful gathering is right in the core of the fight — the fight CWA calls the Fight Forward," said Yasmeen Alston, a member of Local 3640 in Winston-Salem, N.C. "The time is now to stand together, demanding change on all issues, especially those that have continued to be top priority — voting rights, equal pay, healthcare; gender, race and sexual orientation equality; and clean air and water. If you haven't already joined the movement, contact your Human Rights Committee Chair or Local President today." CWA members from Locals 3603, 3611, 3640, 3642, and 3680 marched for economic justice in Raleigh, N.C. Photo courtesy of North Carolina AFL-CIO.